Great to hear from you! As far as I can tell, there is no way to add commands to the Ribbon on the Mac (other than the broad categories under the gear icon). You can, however, access the hidden commands. To do so, click Tools > Macro > Macros. 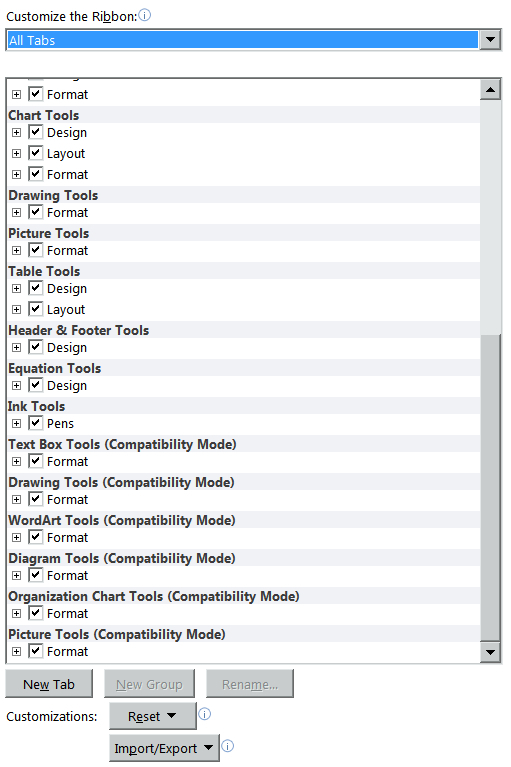 Then, in the “Macros in:” dropdown list, select “Word commands.” Woohoo! Warning: It’s possible to spend hours wandering around in there exploring things. Remember to come back up for air occasionally. The Mac version does allow you to customize some things, however. Click View > Toolbars > Customize Toolbars and Menus > Commands. Under “Categories,” select “All Commands” to get the hidden as well as the unhidden ones. From there, you can drag a command to a toolbar or menu. 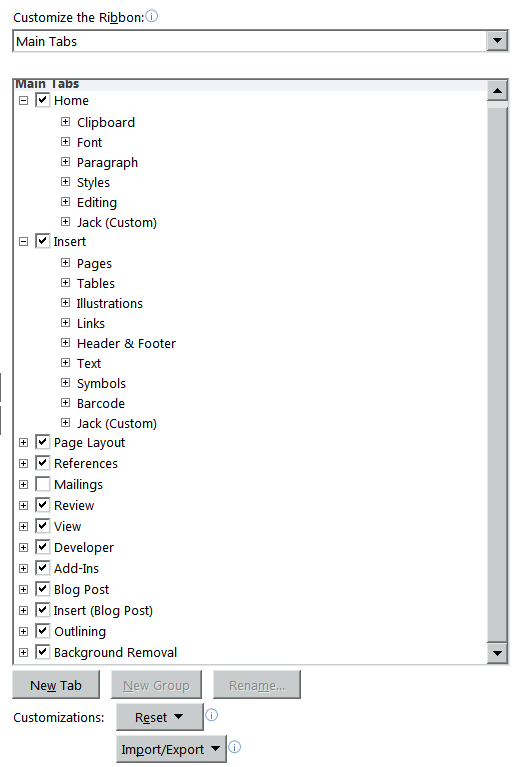 You can also create a new toolbar under View > Toolbars > Customize Toolbars and Menus > Toolbars and Menus. Many thanks for both replies, Jack. I’ll have to go spelunking for those hidden commands. Excellent suggestions as usual. Another problem of having too many unnecessary tools on the ribbon is that if you need to reduce the size of the window MS temporarly removes some of the tools but inevitably leaves the wrong ones! And by the way, I find page colour is helpful for identifying different versions of a file if I need to have them open for comparison, e.g. pink for author’s original, grey for proofreader’s corrections, etc. Each to their own of course. Hi, Jim. Very interesting use of page color. Thanks for sharing! 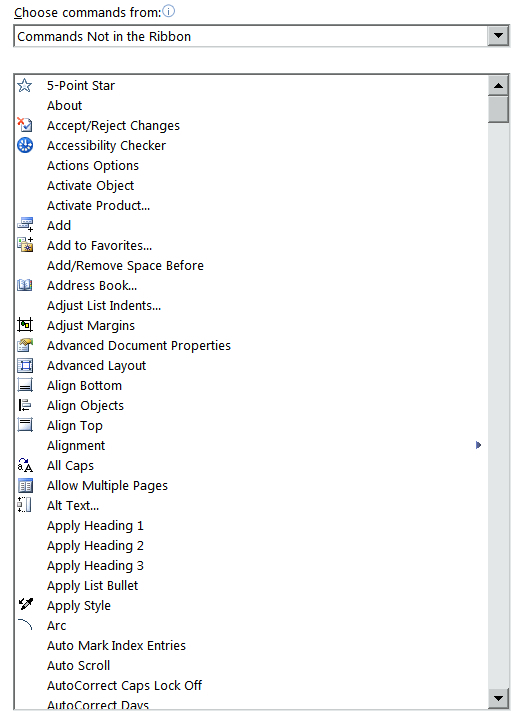 Sadly, Customize Ribbon doesn’t exist in Word 2007, which is the version I’m using. It allows only customization of the Quick Access Toolbar. Unfortunately, that’s true. But why not upgrade? In my opinion, the newer versions are much better than Word 2007.